SOMETHING must be said about the genesis of this work, which began, as most things should, with the particular. 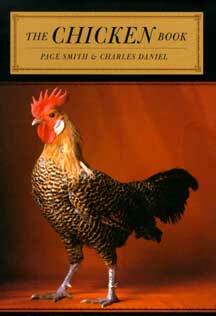 The authors, it turned out, shared an affection for chickens, kept them, enjoyed them, and wished to know more about them. A reasonable way to learn more about them seemed to be to teach a class on the chicken. Some adventurous if quizzical students were rounded up, and, since the teachers knew very little more about chickens at this stage than the students, the venture was largely a cooperative one. The class was divided into small groups, each of which pursued a particular aspect of that remarkable fowl -- the biology and embryology of the chicken, the chicken in art, in song, in folklore and literature, in its historic and economic and anthropological aspects, the history of the chicken, the keeping of ornamental birds, the history of cockfighting, the cooking and eating of the chicken and the egg. The real work of the class centered on these groups who reported their progress periodically. Guest lecturers who were experts on one aspect or another of the chicken assisted us in our efforts. At the end of the class we had a "chicken festival" -- a celebration of the cosmic chicken. The students who had concentrated on the culinary aspects of the chicken and the egg fed us a splendid meal; those who had taken the chicken in music as their topic sang us chicken songs while we festooned a statue of the cosmic chicken with garlands of flowers. At this point, starting out quite naively -- it should be said that we scandalized many of our colleagues by teaching so unorthodox a course -- we found that we had stumbled upon several important discoveries. First, a splendid way for a scientist (Charles Daniel is a biologist) and a humanist (Page Smith is a historian) to cooperate in a teaching venture is to choose a topic, like the chicken, upon which scientist and humanist -- or perhaps better scientist and nonscientist -- can focus their attention. In such a venture the boundaries between science and the humanities, if they exist at all, fade into insignificance and it becomes evident that these "disciplinary areas" are simply different perspectives on the same "thing." The result, we feel, is a great sense of liberation, an exhilarating leap beyond the limits of our respective disciplines. In consequence we, and I think most of the students, found the course both delightful and illuminating. Second, we discovered in the course of our academic excursion that we were, quite unwittingly, following in the footsteps of the great Italian Renaissance natural historian Ulisse Aldrovandi, who, like us, insisted on perceiving the chicken as part of a much larger "order of things." Aldrovandi, in seeing the chicken historically, scientifically, anthropologically, and gastronomically -- one might say, naturally -- had anticipated us by almost four centuries. We realized that in the intervening period, Aldrovandi's "Universal" consciousness had been replaced by the much narrower consciousness of the expert, most characteristically the scientist and his imitators who insisted understanding was only possible by pulling unities to pieces and examining the pieces. Remarkable achievements followed from this "pulling apart" of the world, natural and human, but it occurred to us that this procedure has also been destructive, and we were confirmed in this feeling by reading a book called, in English translation, The Order of Things, by the French philosopher Michel Foucault. Foucault makes much in his book of our intellectual ancestor, Aldrovandi. Indeed his principal thesis is that need to recover the Italian naturalist's sense of the "order of things," and with it an awareness of the unity and coherence of life, without, meanwhile, abandoning the advantages to be gained by "pulling apart." So besides being a kind of informal, preliminary blueprint for a truly comprehensive work on the chicken, this book is intended to suggest a new way of thinking -- or an old way retrieved -- and a new way of teaching in order that that which is divided (including, please God, the chicken) may once more be made whole.